Islington Square is a desirable new site being developed to create new homes, retail spaces and restaurants. Marketing the stylish yet charming period featured studio apartments and flats was a pertinent part of the property project. In order to attract the interest of potential investors and buyers, the marketing team desired to use a visual aid showcasing the new apartments whilst making an impact on a large scale and all in keeping with the marketing budget. Our Head Technician started by speaking to the client about the construction site as health and safety would be a factor to consider in more depth than usual. 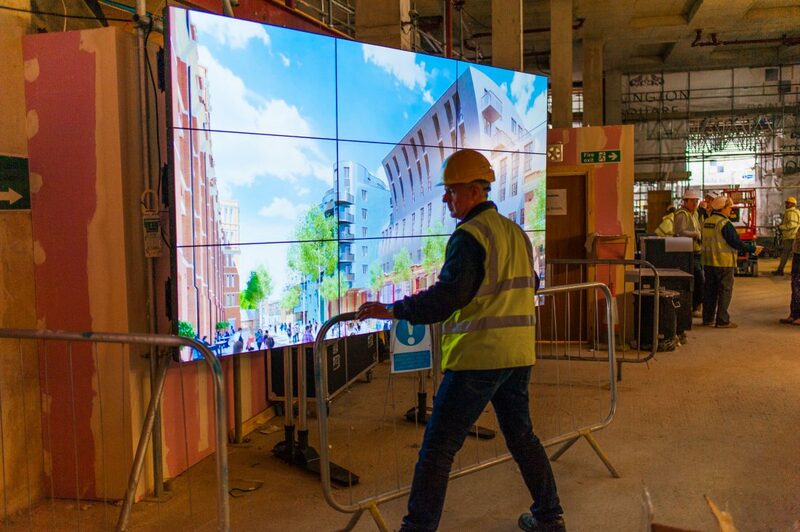 Once we understood more about the site, our lead technician suggested a video wall mounted to a custom built mount which would be robust enough to withstand a long period on a working construction site. Our team set the video wall up within 3 hours and helped organise the content for the marketing material, whilst on site. We provided an apple macbook pro, which was used to upload the clients images, which were re-configured and up-scaled in order to get optimum quality. The technicians stayed throughout the duration of the event and safely dismantled equipment ready for the location to return to a working building site. The client was really impressed with our team and the suggestions they were able to make, he was particularly in awe of the video wall; “I just wanted to say a massive thank you for all your hard work and ideas, the event was a total success and we will certainly be using Video Walls again, it was a great marketing tool!” Errol Rochester – Health & Safety Manager for Sager Construction Ltd. The video wall comprised of 9 Samsung 46-inch screens mounted on a robust stand, which was self supported. 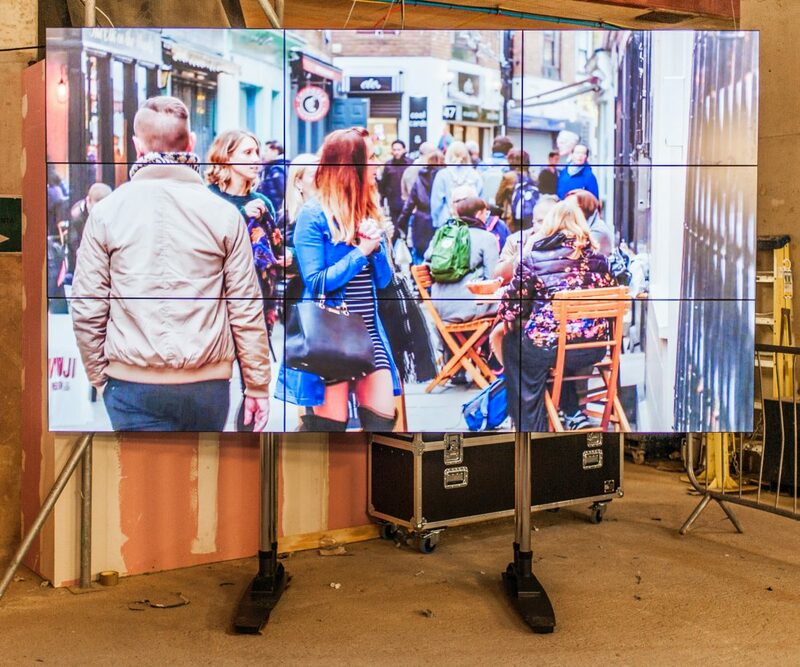 Ordinarily video walls are often set up into a frame built for the size of the screens (which we also offer, click here to see) or mounted up on a wall. But as this venue was a construction site there were no walls to mount the screens to. Our technicians put together a free-standing metal structure which would provide a safe way for the 9×9 video wall to be set up and not topple over, this structure was able to hold the video wall safely up to the height of 1m. Our head technician suggested using the Samsung screens as they have a 5.5 mm bezel-to-bezel design (3.8 mm bezel on the left and top sides and 1.7 mm bezel on the right and bottom sides), which means when the screens are connected to make the video wall, the large image or footage appears seamless, an excellent way to share promotional information and property plans on a pellucid screen, creating a real impact on investors. Another reason our team opted for the Samsung screens was because it features a reinforced panel that deters heat, weather and other stress-inducing conditions. As the clients wanted the screen set up in an area where the environmental conditions could change, these screens were the best options, the reinforced panel prevented screen darkening and any light leakage in the picture quality. The anti-glare panel also further ensured images and footage reached the target audience with minimal distraction by light reflection. We were really pleased with the outcome of this set-up on an unusual site. Video walls are an amazing visual aid and this 9×9 video wall did the job perfectly for our client. Thanks to detailed planning and preparation ahead from both our team and the client and our professional technicians on the day of set-up, the event went smoothly and was professionally executed.